This award winning Wooden Cathedral Game will challenge you as you imagine yourself living during Medieval times! The Roman Empire has just collapsed and the Renaissance era has not yet begun. . .power and influence are dictated by rich landowners and the cathedral is the center of town. 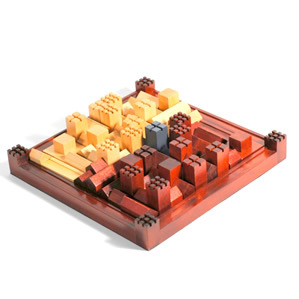 The game board represents the site of a walled city - two sets of playing pieces represent two opposing groups of landowners who battle to gain control by strategically positioning their building pieces on the board. Victory goes to the player who is best at blocking and out-maneuvering their opponent! Perfect for the strategy game lover or Medieval history buff. For ages 8 and up. Availability:The Cathedral Medieval Strategy Game usually takes 1 business day to leave the warehouse, plus transit time.